How Deep Is Your Stack? Third Base, DSPC and Comfort The Children International Team Up! Comfort the Children International is raising money for their programs in Kenya! And you can help by donating $50 for a raffle ticket to win a $5K Diamond Bracelet! 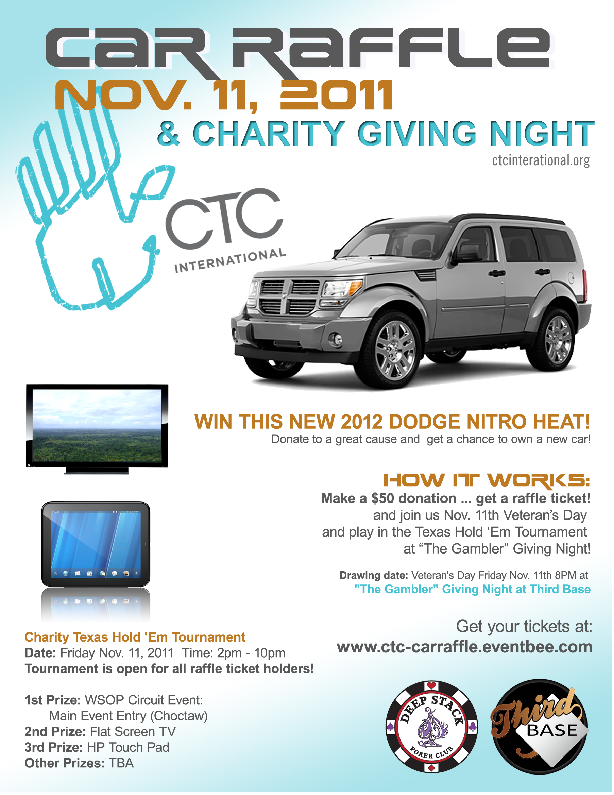 As an added benefit with your raffle ticket, you may choose to play in a poker tournament on 11/11/11! Only 2000 raffle tickets are available! Deep Stack Poker Club will randomly be giving away a raffle ticket to winners of nightly tournaments between now and November 11! Random is the key word! It won’t be every night…and there will be no set pattern! DSPC may send out texts as hints! Other great prizes coming, so stay tuned! Click here to get your raffle ticket today! Remember, once they are gone, they are gone! Posted on September 8, 2011, in Uncategorized. Bookmark the permalink. Leave a comment. Salvation Pizza Tournament of Champions! Deep Stack 2016 Top 100 Championship!